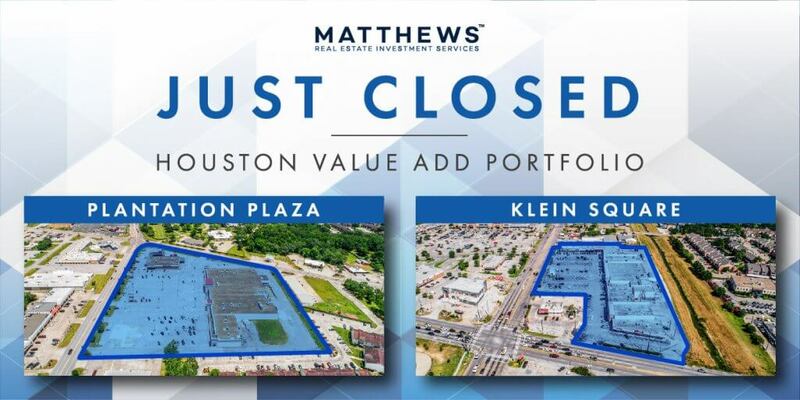 Houston, TX — Matthews Real Estate Investment Services™, one of the nation’s fastest growing brokerage companies, recently sold a two-property portfolio in Houston consisting of 179,777 square feet. Scott Henard, SVP and Regional Director for the Matthews™ Shopping Center Division, led the transaction on behalf of the seller, Brixmor Property Group (BRX), and sold the property to Williamburg Enterprises from Houston. Klein Square, located at the northeast corner of Stuebner Airline Road and Louetta Road, contains 80,836 square feet and was anchored by Food Town that was set to vacate in October. Built in 1978, the asset is conveniently located in a strong regional corridor along one of the busiest thoroughfares in Northwest Houston. National tenants at the center included Petco, Family Dollar, Baskin Robbins, Advance America, among others. Some additional national tenants located in the immediate area include HEB, Spec’s Liquors, LA Fitness, Walgreens, O’Reilly Auto Parts, Bank of America, Whataburger, UPS, and Chase Bank. Plantation Plaza, located at the southeast corner of Plantation Drive and Dixie Drive, contained 98,141 square feet and was formerly anchored by a highly successful Kroger grocery store that relocated a few miles north to build one of their larger format marketplace concepts. Built in 1974, Plantation Plaza was 46.3 percent occupied and contained a mix of local and national tenants consisting of Walgreens, Dollar Tree, Tuesday Morning, Farmers Insurance, H&R Block, Jack in the Box, among others. “Given both properties were under 50 percent occupied, we saw a lot of interest and generated over 12 offers. There were multiple all-cash offers with very aggressive terms and Williamsburg closed the transaction in less than 60 days. We marketed both of these assets individually, but the buyer wanted to purchase both of them, so it made the seller’s decision easier,” said Scott Henard. “These were non-core assets that we needed certainty of execution to be closed in 2018 and Scott and his team did a great job in executing our plan,” said Dan Sutherland, Vice President of Acquisitions and Dispositions for Brixmor Property Group. The Matthews™ Shopping Center Division prides themselves on their commitment to serving their clients’ best interest. With their marketing technology and expansive global database, the division has earned a reputation for excellence in execution. For more information regarding the sale of this asset or if you have any questions regarding available Matthews™ Shopping Center inventory, please reach out to Scott Henard.